Pascale Massey fights for the ball. The junior forward scored a goal in Northwestern’s win over Ball State on Sunday. Six opponents have visited beautiful Lakeside Field this year. All six have left with losses. No. 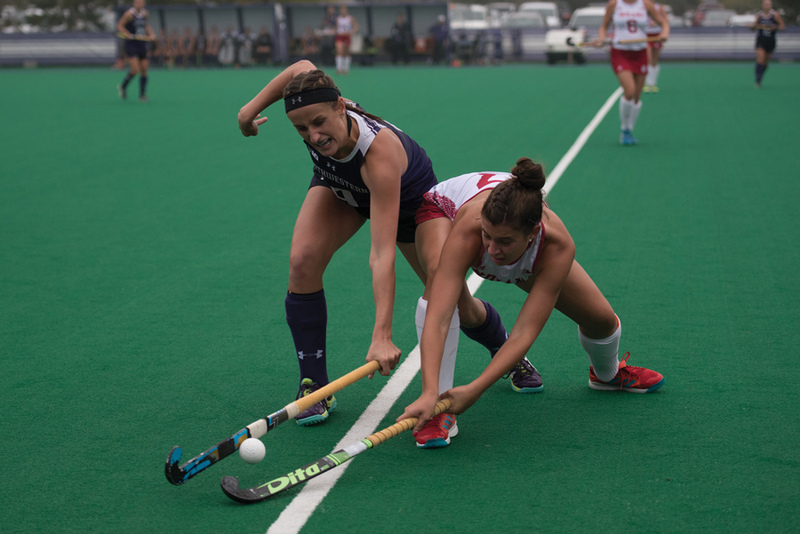 10 Northwestern’s (10-4, 4-1 Big Ten) latest victim was Indiana, (6-8, 0-4) which the Wildcats dispatched 4-1 in a dominant victory Friday before taking down Ball State 6-0 on the road Sunday. NU took control from the first whistle and scored 12 minutes into the game, when sophomore forward Saar de Breij slammed home a rebound to give the Cats a 1-0 lead. When the first half buzzer sounded 23 minutes later, it seemed as though de Breij’s goal would be all NU had to show for an unstoppable opening period performance, in which it allowed just one shot and no corners. However, the Cats earned an untimed corner opportunity just before the horn. Given the bonus chance, sophomore midfielder Lily Gandhi poked home a rebound on the corner, and NU’s halftime lead grew to 2-0. The Cats continued to control play in the second frame. Senior midfielder Elena Curley scored with just under 10 minutes remaining to put NU up 3-0 and well on its way to its fourth Big Ten win of the year. The Cats allowed only two shots on goal the entire game and put 13 of their 21 attempts on net. The game stood in stark contrast to last year’s showdown against Indiana, when the Hoosiers upset then-No. 6 NU 2-1. The Cats were even more dominant Sunday against Ball State. NU jumped out to an early lead on a goal from junior forward Pascale Massey just over a minute into the game and never looked back. At the final whistle, the visitors led in shots 13-3 and corners 17-5. The Cats have now defeated Ball State in each of the past eight seasons. The 2-0 weekend kept NU tied for second in the Big Ten with No. 5 Penn State. Both teams sit one game behind No. 4 Michigan, which remained undefeated in conference play with a weekend win over Rutgers. “We just get to keep the momentum going,” Massey said. “We have a big game in a couple weeks against Michigan, but we need to focus one game at a time. It’s Iowa next, and that match is important for us.